The outdoors offers an awesome learning experience, especially when you are canoeing or rock climbing. Reading about adventure is never enough. Likewise, in the corporate or nonprofit world, you may not succeed by just exploring new ideas. It’s more impactful to also practice new knowledge and skills and get feedback for better results. 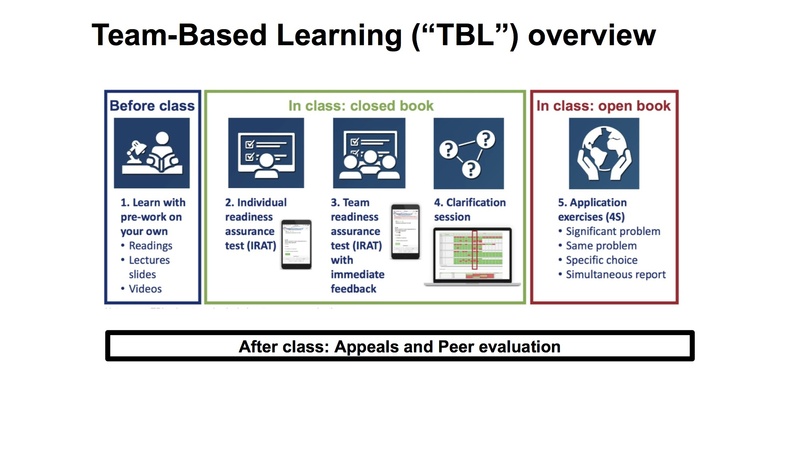 Team-Based Learning (TBL) can bridge that gap between knowing and doing. Executives work closely together in TBL teams of six and embrace collaboration as they learn from each other. As we progressed in our TBL journey at the Boy Scouts of America (BSA), tight training budgets forced us to reduce an entry-level executive course from two weeks to just five days. What an opportunity to do something different! So we produced more than 80 e-learning modules that helped executives master product knowledge and key skills. We also identified the key competencies for success and created TBL classes in strategic work relationships, customer loyalty, and delegation/follow-up. Later, we transformed governance and strategic planning classes for our senior leaders into a TBL format. Our goals were to help executives think like professionals and achieve results. We focused on the application of learning and the adoption of new work behaviors. Wayne McCormack, former president of the Team- Based Learning Collaborative (TBLC) (http://www.teambasedlearning.org/), conducted faculty training on January 2, 2012, and March 4, 2014. TBL Founder Larry Michaelsen provided insights at the 2014 TBLC Conference (http://www.teambasedlearning.org/conferences/) and facilitated faculty training on September 9, 2014. Following the essential elements of TBL was paramount to our success. Teams: We formed teams to reflect diversity in knowledge (e-learning module scores), gender, council location, and ethnic background. Accountability: Students were responsible for learning and accountable to both the instructor and their teammates. Feedback: Students received frequent and immediate feedback during each TBL class and faced formal peer evaluation at the end of the course. Assignment Design: Team application exercises were created to foster collaboration—leading to enhanced learning and stronger team development. Homework was core content in the form of readings, PowerPoints, or videos assigned to executives for review ahead of classroom time. iRAT (individual Readiness Assurance Test) evaluated executives on key concepts from the assigned homework. tRAT (team Readiness Assurance Test) had the same questions as the iRAT, and was completed by each team. Team points were awarded based on the number of attempts it took the team to select the correct answer. Appeals allowed teams to challenge any question they felt was poorly worded or any answer that was incorrect or misleading. Mini-lecture was delivered by the facilitator to clarify any key concepts not yet mastered by the executives. TAEs (Team Application Exercises) were the heart of TBL and took most of the classroom time. Teams reviewed each of the same, significant problems—selected and revealed their specific response at the same time—and explained and defended the reasons behind that answer to the other teams. Significant Problem: Teams work on a problem (one at a time) that is significant to executives. Same Problem: All teams work on the same problem. Specific Choice: Teams apply course concepts to make a specific choice. Simultaneous Report: All teams report their answer at the same time. Instead of giving answers, facilitators found that posing questions encouraged deeper reflections in the TAE process. They challenged executives to listen, think, and explain—leading to enhanced understanding and application of key concepts. What was your answer and why? Did any other team agree with this answer? Why did you agree? Could we hear from another team that may have disagreed? Are there any other options for a correct answer? What might be wrong with the answers you have heard so far? Based on this discussion, what do you think? Preparation: How well did executives prepare before they came to class? Contribution: How well did they contribute to team discussions? Respect for Others’ Ideas: How well did they encourage others to contribute ideas to team conversations? Flexibility: How flexible were they when disagreements occurred? Students helped create future tRAT questions —as they appealed any question in the tRAT process. They were asked to rewrite any question (or create new ones) that would make concepts clearer. In many TAE scenarios, we designed the learning process to have more than one correct answer— as this would reflect real work situations. We also did not score the TAEs—to keep focus on discussions and critical thinking. We strongly encouraged teams to not vote when making decisions in either the tRAT or the TAE process. It was better for teams to reach a consensus after discussing all options available. We tracked team scores and average individual scores and noted that typically team scores were higher. In 20 years of teaching, Larry Michaelsen noted that more than 99.95 percent of the nearly 1,600 teams outperformed their best member by an average of nearly 11 percent. The further away a facilitator stood from any executive speaking for his or her team in the TAE process, the more likely that individual would connect with all the other executives in the classroom. When a facilitator stood too close, it unintentionally caused that executive to respond to just the facilitator—and not engage with the class. With a backward design in TBL, we first looked at the business results local operations were seeking, and identified the key behaviors that drove those results. We reviewed the competencies assigned to each job profile. We reflected on what executives needed to do when back on the job—and identified what they needed to know to master those behaviors. Level 4 Results: What did we want executives to “achieve”? Level 3 Behavior: What did we want executives to “do”? Level 2 Learning: What did we want executives to “know”? Level 1 Reaction: What did we want executives to “feel”? Want to “canoe” or “rock climb” the world of corporate or nonprofit talent development? Give Team-Based Learning an adventurous look.